The 30-minute 'mini-enduro' race will be televised live to 39 countries in five different languages. Magus Laird commented: "I am really pleased to be working with Julius and the HRDC again, as they did such a great job for us last year - their races were action-packed throughout and Julius promises to deliver the same excitement with the HRDC MGB50 race. It's also very fitting that this celebration of 50 years of the MGB is put on record for posterity." Alongside the FIA Historic racing MGBs that will also be racing at Mallory, Julius hopes to bring along representative classes of 'club' racing MGBs. "I started out racing in a Prodsports MGB and eventually went on to compete in the inaugural 1980 Willhire 24-Hours race at Snetterton in that car - and finished. Therefore, I have a special interest in inviting current 'club' MGB racers to this event. The Motors TV coverage is so extensive that it will be a great opportunity for these club-spec MGBs to get the exposure that they so richly deserve." The MOTORS TV package not only provides great racing coverage, with three-way cameras mounted in one of the race cars; it also provides every driver with an edited DVD of their race. 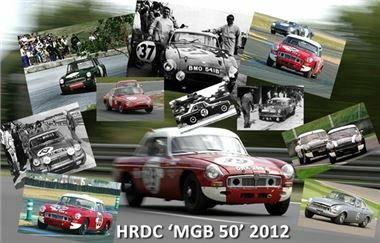 Competitors who are currently running MGB and MGBGT race cars can register to race in this special televised event via the HRDC website at www.hrdc.eu, or by contacting Julius Thurgood direct at the HRDC.